Eyebrow trends throughout history have alternated between bushy, natural-looking brows to pencil-thin brows that made a statement. In the distant past, the eyebrow styles reflected the ideals of the culture. The more recent decades, starting in the 1920s, it became the movie stars who came to dictate which eyebrow style was in-vogue. Both men and women wore makeup and sported the eyebrow trend of the culture. Thick, bold eyebrows were desirable as the Egyptians saw the face as sacred. The Egyptian god, Horus, modeled these dark, thick, pronounced eyebrows that drew attention to his eyes. Egyptians followed suit, using black carbon paint and black oxide substances to extenuate the black, prominent brows even more. Both Ancient Greek and Roman cultures valued women’s purity and the natural, unkempt eyebrows were desirable. Women who had unibrows were prized for their beauty and intelligence. Women who didn’t have a unibrow would use paint to give an appearance of one. Married women had natural eyebrows while single women would use black incense to touch up theirs. The Middle Ages saw a 180 diversion from the thick, natural-looking brows of previous centuries. During the Middle Ages, the forehead was the focal point of a woman’s face and was what defined their beauty. To bring more emphasis to their forehead, the eyebrows had to be downplayed. As a result, women in the Middle Ages heavily plucked their eyebrows to the point where they were barely noticeable. During the Elizabethan era, many women dyed their eyebrows a reddish-blonde color in homage to Queen Elizabeth who was a strawberry-blonde. 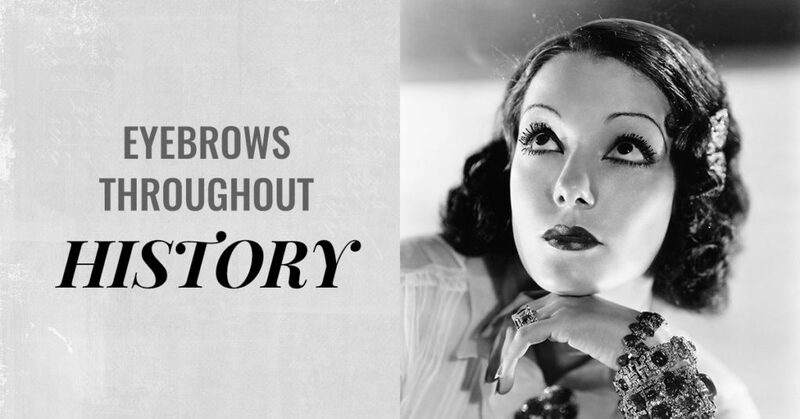 The thin eyebrows of the past continued into the 1920s where eyebrows were severely plucked and penciled in thin. The brows were straight and extended beyond the outer corner of the eye. The eyebrow style of the decade was inspired by silent movie star Clara Bow. This decade became the first time commercially made eyebrow products were available. The pencil-thin, dark eyebrows of the 1920’s carried into the 1930’s. The only nuance was a more pronounced, curved arch. In the 1940’s eyebrows veered from the pronounced, severe look to a softer look with heavier, thicker brows that kept the prominent arch. Women in the 1950’s were all about make-up, using as much as possible on their faces. The complete face makeover was capped off with thick, immaculately-shaped brows with a high arch. The 1950’s look could be seen on the faces of famous stars of the time including Audrey Hepburn, Elizabeth Taylor and Marilyn Monroe. The thin, minimal eyebrows of the Middle Ages came back somewhat in the 1960’s. The brows were heavily plucked or even shaved off and then penciled in for a bold, but somewhat natural look. Actress Sophia Loren had the most recognizable eyebrows of the decade, a look she accomplished by shaving off her brows and using short, thin strokes to pencil in her new brows. With the hippie movement in full-swing, the natural, bushy, unkempt brows once again became all the rage. Ali McGraw and Lauren Hutton were two celebrities that sported the natural, rarely unplucked brows. The bushy, natural-looking eyebrows of the 1970’s continued into the 1980’s where the bushier and bigger the brows, the better became the norm. Another shift happened in the 1990’s when the bushy, ungroomed brows of the 1980’s gave way to the heavily tweezed brows of the 1990’s. Actresses such as Pamela Anderson and Drew Barrymore sported the overplucked eyebrows that defined the look in the 1990’s. The bold, minimally plucked brows of the 1980’s became more refined in the 2000’s where bold, thick brows were once again the ideal. The brows today are seen by some to be more makeup than hair as women wax, pluck and apply make-up galore in an effort to get those perfectly shaped brows that combine bold elegance with a soft, natural look. For great-looking brows today, eyebrow pencils, gels and waxing are your best friend. Women are also experimenting with threading, microblading and painting their brows for a more unique look. Eyebrow styles are constantly changing. Are you keeping up with the latest trends in brows? If you want to stand out and look your best, stop by one of our campuses to have your brows professionally done or to learn about our makeup artistry program!